FREE pet games for kids for you both to enjoy. 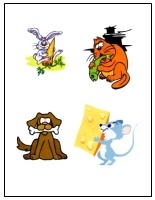 You can play free kids games by downloading these picture cards of favorite toddler pets. 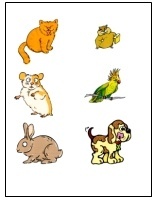 Dog, cat, mouse, rabbit and other favorites. These are great kids games to play when your stuck indoors and looking for something new to do. The download button for these printable games for kids is at the bottom of this page. If you have some thin card to print these pictures on then all the better. If not just use office paper they just won't last as long (especially with toddlers). Next cut the paper into squares with a pet picture in the middle of each square. Now you are ready to play these free toddler games. First game: An easy one to start, show your toddler a pet game picture then ask your child what noise does this pet make. If your child is very young you may need to give them a couple of clues (options). i.e. Meeow or Woof Woof, you get the idea. So you think it's too easy then let's see you make a goldfish noise then (not so clever now are you :-). you can also see if they know the name of the pet. Not so difficult for the basics such as cat and dog, gets harder with pets like a hamster. Second game: What does your pet eat, I have kept it simple for this one as even I'm not completely sure about a hamsters feeding habits so I don't expect most children will know (unless your toddler has a hamster). 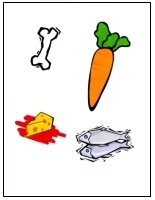 There is a printable sheet with all the pet foods on such as a bone, carrot, fish you get the idea. Just download this printable then as before cut into squares with the picture in the middle of each square. I have done a "cheat sheet" for the very little ones to take a look at. It has some of the pets eating the mystery item so they can check. You will need Adobe pdf reader to view and print these pictures. You can download it for Free here Get adobe reader. I'm sure you'll have a great time with these pet games for kids. Enjoy.